The Konohana Bridge was built in 1987 by the Hitachi Zosen Corporation for the City of Osaka. 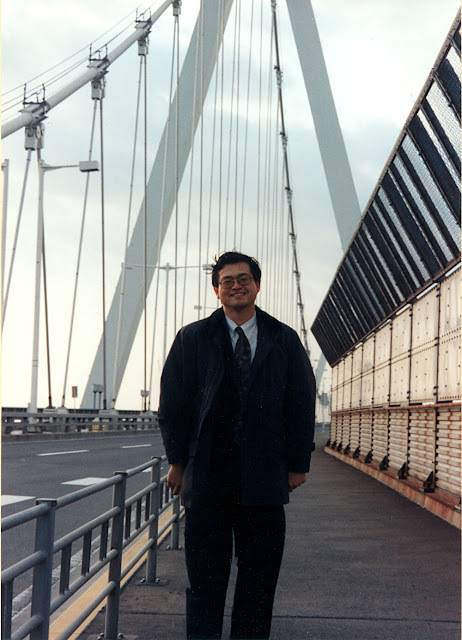 The chief construction engineer was Hiroshi Tanaka who kindly agreed to meet me at the bridge and discuss its design and construction. Q: Does the Konohana Bridge have balanced spans? If it is unbalanced, how did you address the unbalanced load? A: It is almost balanced however it is slightly wider at the entrance of the Konohana-side (for an on-ramp). Therefore the distribution of the dead loads is unbalanced in the longitudinal direction. This effect is considered by the static analysis by making the sag lengths in the side span of the main cable are different; Konohana-side (6.995m) and Yumeshima-side (7.OO8m). Q: How accurate were the dead load displacements? A: The displacements of the diaphragm at the anchorage were measured after the removal of supporting beams. The measured displacements corresponded closely with the displacements from the analysis. Q: What do you believe was the most challenging parts of the construction? A:The tension adjustments of the inclined hangers were the most challenging (apparently vertical hangers are fairly easy to adjust, but the longitudinal vector component makes the adjustment more problematic). Q: What made the City of Osaka choose this bridge type in the type selection? A: The cable-stayed bridge might be the reasonable selection at the time of the construction. However the construction of the cable-stayed bridge (i.e., Tenpozan Bridge) was also being planned very close to the site by the Hanshin Expressway Public Corporation. Therefore other bridge types were explored by the Osaka Municipal Government. The mono-cable and self-anchored suspension bridge was selected from the economical and aesthetic aspects. (Also, poor soil conditions probably influenced the decision to self-anchor the cables). Q: What is the seismic criteria for the bridge? A: Seismic design intensity (e.g., seismic coefficient = 0.3 g) was determined according to the Highway Code of 1980, which provides a method of modified seismic design. The ground condition is very weak at the site. The safety was verified by doing dynamic analyses considering soil-structure interaction. Q:What is the foundation type? A: The foundation is a pile cap with 1.5 m. dia. pipe piles. Because of the poor soil, the pipe piles were driven 51.4 m into the ground. Osaka Bay Bridges: Konohana Bridge (2) by Mark Yashinsky is licensed under a Creative Commons Attribution-NonCommercial-ShareAlike 3.0 United States License.